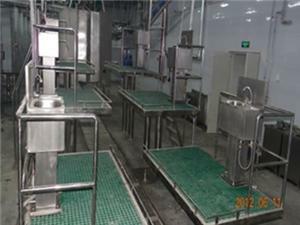 poultry slaughter line,poultry slaughtering machine. Platform surface size is 2000×1200×600mm, the legs are stainless steel ∮159×2 round tube, frame is stainless steel □80×40×2 and □50×50×2 square tube. cross arm space is 300-500mm.